use depends on the application need. A high concentration of acidic compounds in a lubricant can lead to corrosion of machine parts and clogged oil filters due to the formation of varnish and sludge. When a lubricant breaks down, acidic by-products will be formed from the chemical decomposition of the base stock and additives in the presence of air and heat. Total Acid Number (TAN) is a measure of acid concentration present in a lubricant. The acid concentration of a lubricant depends on the presence of additive package, acidic contamination, and oxidation by-products. Occasionally, the depletion of an additive package may cause an initial decrease in TAN of fresh oil. However, the accumulation of oxidation by-products and acidic contaminants in an oil over time will always lead to an increase in TAN. This test is most meaningful in industrial machinery applications although sometimes it is recommended in engine applications along with Total Base Number (TBN). to top-off or change the oil. 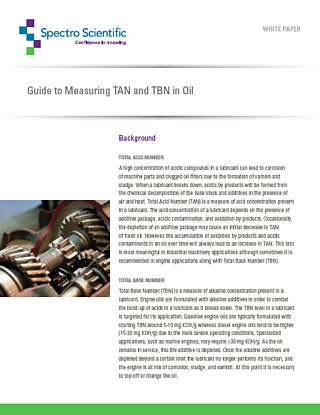 Monitoring TAN and TBN is an important test for measuring lubricant condition. There are several methods available ranging from expensive laboratory methods to quick field tests. In a laboratory setting, methods are chosen based on the highest accuracy and repeatability that can be achieved with a decent throughput. Out in the field, it is most important to get a trustworthy result quickly enough that preventative or corrective maintenance action can be taken before major equipment failure. The best method to use depends on the application need.